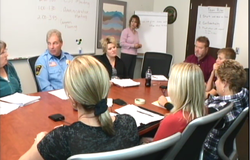 White Pine Consulting Service (WPCS), in partnership with Waupaca County Department of Health and Human Services, currently holds a contract with the Wisconsin Department of Health Services - Division of Mental Health and Substance Abuse Services to provide training and technical assistance (T and TA) to counties and tribes developing and sustaining Coordinated Services Team (CST) Initiatives in Wisconsin. Please click on one of the headings below for information on the availability of training and technical assistance. Counties and Tribes in the beginning stages of CST development have the opportunity to receive on and offsite TA, based on their specific strengths and needs. Training considered essential for service coordinators, administrators, coordinating committees, and community partners. The "Next Step" - trainings and workshops developed to increase skills gained during essential training and through experience with CST. Many workshops are available on a regional basis. In addition, regional meetings offer an opportunity for networking, brainstorming, and for the development of learning collaboratives. Web-based training resources are available and being expanded to supplement onsite, regional, and statewide training and technical assistance opportunities. Form to request additional CST-related training and technical assistance from the Division of Mental Health and Substance Abuse Services.